The Grivel A&D Decender Ascender is a multi-function right or left rope device that can be used as ascender or descender using the hole of the forged plate. Easy handling due to the ergonomic rubber grip. Weight: 258 gr, 9,2 oz. 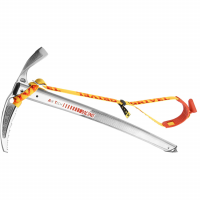 Built with multi-ply stainless steel, Flex Bars from Grivel allow you to walk more comfortably when you're traveling with crampons on. The springy flex of the bar works like a car's leaf suspension to flex with the motion of your boots. Whether you're ascending ice or trudging across glaciers, the semi-rigid G14 Crampons from Grivel take both in stride. Forged points penetrate hard ice with less vibration, while configurable front points go mono or dual depending upon the angle of ice. This ascender is easier to handle because of its ergonomic rubber grip. Can also be used as a descender, using the hole of the forged plate. Choose left or right, or both.